Autosomal dominant nonsyndromic hearing loss (ADNSHL) accounts for about one-fifth of hereditary hearing loss in humans. In the present study, we have analyzed a three-generation family with 14 of its members manifesting ADNSHL, using a genome-wide linkage mapping approach. We found a novel locus DFNA59 between the D11S929 and D11S480 markers in the chromosome location 11p14.2–q12.3. The highest two-point lod score of 5.72 at recombination fraction = 0 was obtained for D11S4152, D11S4154, D11S1301, D11S905 and D11S1344. 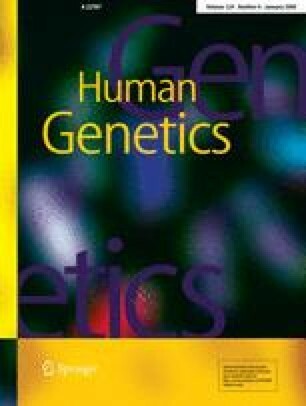 The critical genomic region comprising about 37 megabases of DNA is proposed to carry a gene for ADNSHL in the family. About 50 cochlear-expressed genes mapping to the region are strong candidates which we propose to examine to identify the gene responsible for the hearing impairment. The online version of this article (doi: 10.1007/s00439-008-0596-3) contains supplementary material, which is available to authorized users. We thank the members of the family examined for participating in this study. This research was supported by JNCASR, Bangalore and a research grant from DBT, New Delhi. We thank Sharat Chandra for critical reading of the manuscript and helpful discussions.